The sun sets on the Polar Pioneer in Unalaska's Broad Bay on Monday. KUCB/John Ryan photo. Shell Oil's Polar Pioneer rig left Alaska's Dutch Harbor for Port Angeles, Washington, on Wednesday. The energy giant's other Arctic rig, the Noble Discoverer, left Dutch Harbor for Everett, Washington, on Monday. Other ships in Shell's Arctic fleet are expected to leave Alaska over the next couple of weeks, and the company has not disclosed the fate of the 400 employees who have worked on the project in Anchorage. But the departure of the 30-story-tall Polar Pioneer is the most visible sign that Shell's 8-year hunt for oil in the Arctic Ocean has come to an end. Shell announced on Sept. 27 that it was abandoning Arctic exploration "for the foreseeable future." The Polar Pioneer had been a lightning rod for opponents of Arctic drilling. Greenpeace climbers boarded it as it was being transported from Asia this spring. Activists in kayaks tried to block the rig's journey to the Arctic in Seattle and other cities. No protests greeted either rig this week as they returned from the Arctic to Unalaska's Dutch Harbor. On Wednesday afternoon, two Crowley Maritime tugs, the Ocean Wind and the Ocean Wave, towed the Polar Pioneer into the swells of the Bering Sea. A third, much larger tug, the Tor Viking, followed nearby, according to marinetraffic.com. The Polar Pioneer leaves Unalaska Island. Pipa Escalante photo. In 2012, only one tug was transporting the Polar Pioneer's predecessor, the Kulluk, when the rig broke free and ran aground off Kodiak Island. The Kulluk wound up in a Chinese scrapyard. The wreck of the Kulluk was one of a series of mishaps that cost Shell time, money and credibility with government officials. Three separate federal agencies (the Interior Department, the Coast Guard and the National Transportation Safety Board) condemned the risks the company and its contractors took at sea. 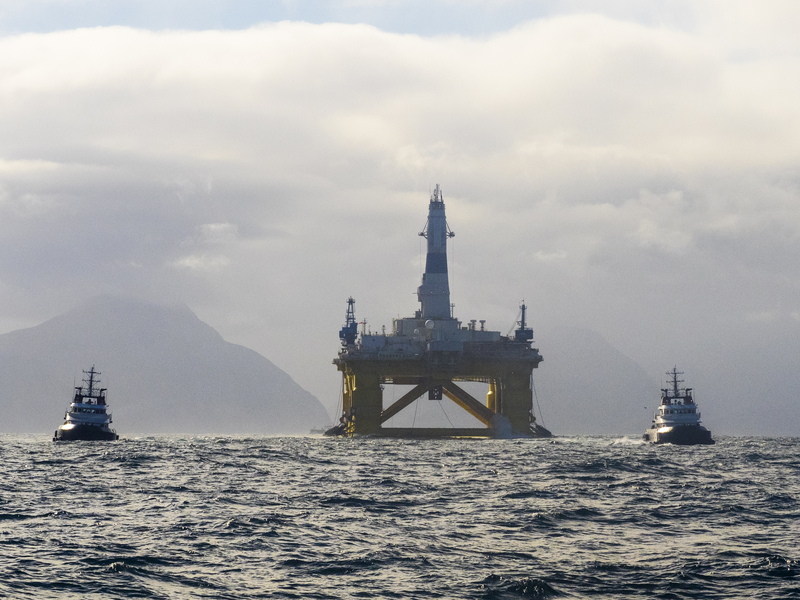 This year, Shell reported safely drilling a well more than a mile beneath the floor of the Chukchi Sea about 70 miles off Alaska's northwest coast. Federal regulations aimed at protecting walruses from the noise of drilling prohibited the company from drilling a second well at the same time less than 15 miles away. Other than not striking a major oil deposit, only one major mishap was reported during this year's drilling season: The icebreaker Fennica hit an uncharted rock as it was leaving Dutch Harbor for the Arctic. The rock tore a three-foot hole in the Fennica's hull. Navigational charts in western and Arctic Alaska often still rely on underwater surveys conducted half a century ago. With much of Shell's 30-vessel Arctic fleet staging in Dutch Harbor's preferred locations, the Fennica was anchored in a shallower part of Unalaska Bay than ships of its size usually use. With a critical piece of oil-spill equipment on its stern, the Fennica returned to Dutch Harbor for temporary repairs, then sailed to Oregon for permanent repairs. Shell's sudden withdrawal from the Arctic last month stunned many Alaskans. Gov. Bill Walker called it "a very tough day for Alaska." Environmentalists, concerned about the risks of oil spills and climate change, rejoiced. Shell supporters in Alaska blamed federal regulations for Shell's withdrawal while environmentalists claimed credit for forcing the oil giant to stop the heavily scrutinized project. But the demise of international oil drilling projects elsewhere in the Arctic Ocean suggests that plummeting oil prices, not U.S. politics, drove Shell's decision. Shell officials are expected to spell out the financial implications of the abandoned Arctic venture for the company's shareholders when they discuss the company's third quarter results later this month.